Brandon Boterf and Freckles garnered a gold medal in the Western Stock Seat Equitation, as well as a silver medal in the Working Trails at the Special Olympic State Equestrian Games. Photo Courtesy of the VTRC. 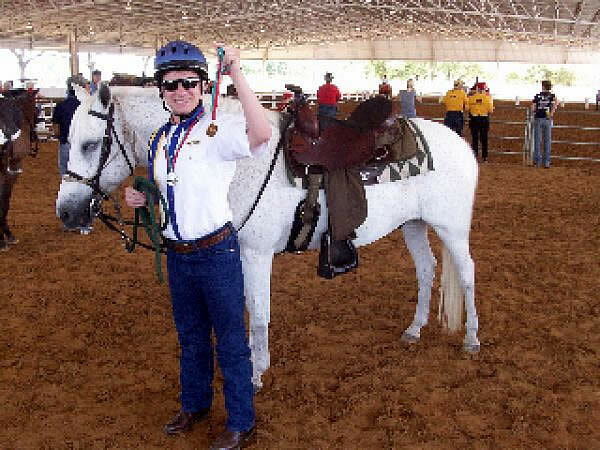 Loxahatchee, FL – May 27, 2010 – The Vinceremos Therapeutic Riding Center (VTRC) recently returned from the Special Olympic State Equestrian Games, held May 21-22, where 16 of their top students had the opportunity to compete. This year’s competition was held at the Florida State Fairgrounds in Tampa, FL. VTRC took home five gold medals, nine silver medals, nine bronze medals, five fourth place ribbons, two fifth place ribbons and one sixth place ribbon. The team representing VTRC included 16 riders who participated in 19 events. The events included English and western equitation, trail ride competition, dressage, and pole bending. VTRC had numerous riders compete in the level ‘A’ classes that requires them to walk, trot, and canter unassisted. Pole Bending proved to be one of the most successful events for VTRC as all of the athletes maneuvered exceptionally well through the poles.